Lead your choir and assembly into prayerful worship with some of the best contemporary choral music available today. This is cathedral choral music at its best—solemn, soul stirring, grand. 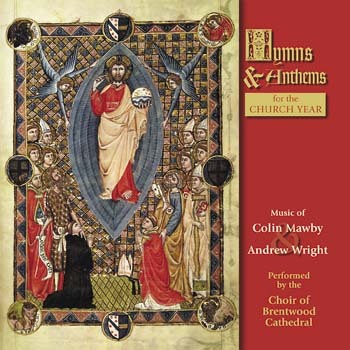 Recorded at Brentwood Cathedral in Essex, England, the latest collaboration by these gifted composers provides 15 richly crafted new works for seasons and feasts throughout the year. Mixing hymns with assembly parts and anthems for choir and organ, the collection disproves the claim that "they don't write music like this any more." Nonetheless, these are not mere copies of old standards. Steeped in the church's legacy of sacred music, Colin and Andrew are also men of the twenty-first century. They fashioned these new pieces with a delightful balance of traditional and modern styling. Majestic enough for solemnities at cathedrals, the music can also be adapted by the average parish for Sundays throughout the year. Choir directors will find tantalizing new SATB works for Advent, Christmas, Lent, Holy Week, Chrism Mass, Easter, Ascension, Pentecost and Christ the King. Marian songs, psalms and Communion processionals alternate with songs for weddings and funerals. More than a good learning tool, the CD is pure listening pleasure. Conducted by Andrew, the Brentwood choirs are outstanding once again. Blessed with superb acoustics, the big cathedral also houses a magnificent pipe organ, as this recording makes clear. The collection also includes several a cappella works.